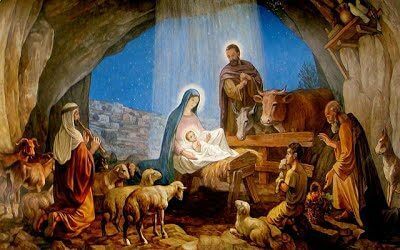 Christmas Day - Nativity of the Lord – Solemnity - My Catholic Life! Since the dawn of time the pages of pagan mythology filled mens’ imaginations to the brim with wondrous stories. Educated men who could read and write Latin and Greek, broad-minded men trained in philosophy, believed that the forests were thick with fairies, that the god of war launched thunderbolts across the sky, that a wise man carried the moon and stars in a box, and that ravens prophesied. Some ancients wore a leather pouch around their necks stuffed with crystals to ward off evil spirits. Others bowed to the morning sun to thank that great ball of fire for rising. And then…it all ended. A tired world retreated as man’s true story swept like fire over the earth. In 380 A.D. an imperial decree established the faith preached by the Apostle Peter to the Romans as the religion of the empire. Grass grew high in the Roman Forum. Weeds pushed through the cracked marble slabs of the ancient temples. Cows grazed where senators in white togas once offered incense to the god of this or the god of that. No one cared anymore. Pagan altars crumbled. The priests left for good. The vestal virgins walked away and found husbands. Marble was removed from the walls of the abandoned temples and reused in Christian Basilicas, where candles burned before a new God-man hanging on a cross. The Father’s hands were molding and forming and shaping a new Christian culture—our culture. Christmas is the night the future began. When we hear now that a cow jumped over the moon, that a nocturnal fairy trades coins for teeth, or that a pot of gold sits at the end of the rainbow, we chuckle and slap our knee. The river of mythology had always run parallel to the river of philosophy. But in Christ these channels merge. In the Christian land, the river of truth flows into the river of the imagination. Myths did not so much disappear as fuse with reality. Magic and meaning formed into one beautiful, sacramental, compelling, intellectually satisfying force. Yet the Christian God became a man, not a book. And He did not come just to end mythology, but in order to die. God came so close to us that we killed him. God became man, paradoxically, so that He could cease to be God and taste death. Without this sacrifice, without this being-for-death, we would be unable to interpret nature, suffering, love, death, or war. There’s a thousand ways to begin a story: “So, there I was”; “In a land far, far away”; “Once upon a time.” The Christian story starts, “This is how the birth of Jesus Christ came about…” This wondrous beginning leads to a tragic middle and a rousing end. It is the story of Jesus Christ, Emmanuel, God with us. He is born of Mary but is, more deeply, from the Father. The Christ Child is the wordless Word who begins His daring mission in all humility. He beckons us closer to the crib for a moment, but many stay at His side their entire lives. We stay because we have real questions that demand real answers that can be found nowhere else except in the Church. While all other stories fade, the Christ story becomes more and more true as we mature. This story alone gives meaning to death, purpose to suffering, cause for joy, and consolation to the broken. This story alone rises above any one culture, city, language, or nation. Its plot is everyone’s drama, its heartbreak everyone’s sorrow, and its victory everyone’s prize. This is the story of Jesus Christ, and this story begins today. Christ in the manger, Your humble coming as man fills us with hope that our lives matter, that God is truly with us, and that we are never alone, even in death. You shared our human nature in every way but sin, and so give us hope that we will one day share life in heaven with You.